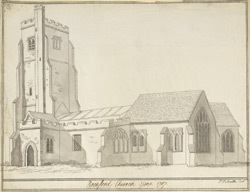 A south east view of St Andrews Church at Rochford in Essex. This Tudor church is built in a similar style to the nearby Rochford Hall, once home of Anne Boleyn's father. It has a fine west tower of brick with diaper work (an all over surface decoration of a small repeated pattern), angle buttresses, and a stair turret. The stair turret, which raises slightly above the west tower, can be seen in this view.